That image above is what got me. Most of the requests I receive to watch peoples short films are a bit unnerving. I always want to encourage young artists but at the same time I wouldn't be doing them any favors by sugar coating my reactions. A 13 minute Scottish film with an ostrich as its protagonist? At the very least I was already pulling for this one. Danny (Ostrich, voiced by Duncan James) is having a rough day, he loses his job and his girlfriend Katie (Amy E Watson) in quick succession. That's all I really want to say about the plot because I'd rather not give anything away. Its only 13 minutes long and yes it is worth your time. That is if you want to watch a sock puppet deal with depression. I'm always up for something new and this is most certainly something I have not seen before. The Greyness of Autumn is at its best when everyone is playing it straight. 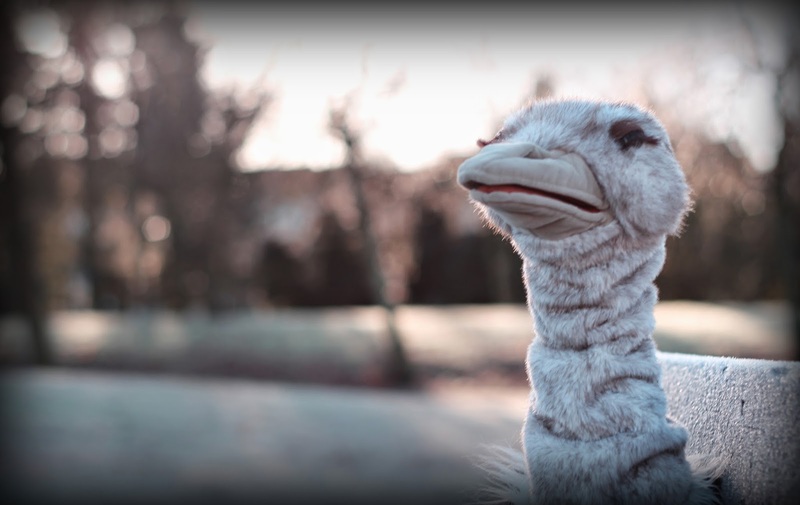 Casting a sock puppet ostrich as your lead is absurd enough and gives the piece more than enough humor. When ancillary characters are playing it big the film gets a bit shaky. These moments are limited but enough to pull me out of the piece and when you are working with such a limited running time you don't want to do that too often. With some minor issues mainly concerning the overall tone of the piece aside, the use of the ostrich is honestly a stroke of genius. When dealing with such a heavy subject the filmmaker is able to sneak up on you and not come across preachy or melodramatic. Its a great way of catching the viewer off guard and makes room for some truly human moments. The dinner sequence is great, its the reason I watched the film a second time. The performances from James and Watson are fantastic. I really wish this film would have spent more time with their relationship. Watson is utterly believable as the girlfriend and that is no small feat. With that being said when filmmakers want to take on important themes they should have more to say about the subject. Overall this is a great little film that I feel very comfortable recommending. 'The Greyness of Autumn' (2012 Short Film) from Quick Off The Mark Productions on Vimeo.